of them,--hold a very honorable place in the multitude of sculptured works which the imperial period has left us, and are deserving of some consideration. 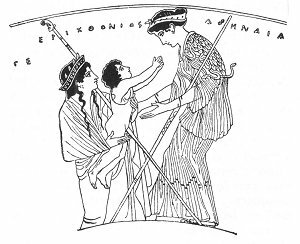 The traditional type of torch-bearers, or dadophori, was not susceptible of a similar impassioned treatment. But one remarks, nevertheless, in the best specimens the advantageous effect which the artist has produced by the ample Phrygian garments and by emphasizing the different emotions of hope and sadness portrayed on the countenances of the two young men. We possess a remarkable reproduction of this divine couple in the two statues discovered near the Tiber, which Zoëga attributed to the epoch of Hadrian and which were possibly imported from the Orient to Italy. 1 (See Figures 47 and 48.) It will be seen how their author succeeded in offsetting the defective symmetry resulting from the fact that the two figures, which are intended as counterparts, have both their mantles fastened at the right shoulder and falling down at the right side. cutters of stone--they deserve no other name--who are responsible for these productions, were often content with roughly outlining by a few strokes of the chisel the scene which they pretended to reproduce. A garish coloring then emphasized certain details. The work is sometimes so hastily executed that the contours alone are distinctly marked,, as in the hieroglyphics. It sufficed, it is true, merely to outline representations, the meaning of which every faithful devotee knew and which he completed in imagination; and it is our ignorance that feels so vividly the imperfections of these awkward and vague compositions. Still, some of the smaller bas-reliefs could never have been more than downright caricatures bordering on the grotesque, and their deformities strongly remind us of the little toy gingerbread men which are sold at our fairs. The carelessness with which these tablets were executed is excused by their places of destination. 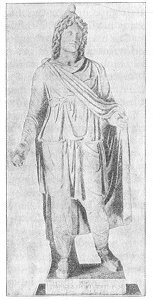 The mystics of Mithra were wont not only to consecrate them in their temples, but also to adorn with them their modest dwelling-houses. This domestic consumption explains the enormous quantity of these monuments, which have been found wherever the cult penetrated. To satisfy the incessant demand of the faithful for these figures, the workshops in which they were carved must have produced them rapidly and in quantities. The manufacturers of this brummagem sculpture had no other thought than that of cheaply satisfying their clientage of devotees, whose artistic tastes were far from exacting. The ancient manufacturers turned out hundreds of smaller tauroctonous Mithras, 1 just as our image-makers multiply in profusion the very same type of crucifixes and the very same Virgin Mary. It was the religious imagery of the epoch, and it was not more æsthetic than is ours to-day. the immolation of the bull. Sometimes its value is enhanced by the addition of a sort of predella, divided into three or four smaller scenes. Again, its composition is complicated by an upper panel decorated with accessory scenes. These, finally, also occupy the borders of the monuments, and encompass on four sides the principal representation. 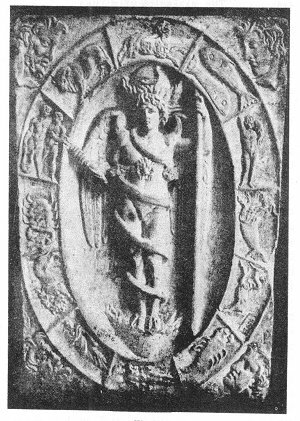 Again, the fancy of the workman taking flight, the tauroctonous god has been enclosed in a circle ornamented with the signs of the Zodiac, or in a crown of foliage. Frames were added or omitted. Considerable ingenuity was exercised to give new forms to the sculptured plaques. They were indiscriminately square, oblong, semicircular, trapezoidal, or even round. There are no two of these pieces which are exactly alike. presumably imported from Asia Minor. 1 The beautiful bas-reliefs of Virunum were likewise brought from abroad, probably by way of Aquileia. We know by the passion of the Four Crowned Ones the importance of the quarries of Pannonia in the third century, 2 where marble was not only quarried but worked. These stone-yards appear to have been an important center for the manufacture of Mithraic votive offerings. In any event, there are several of them, exhumed in the temples of Germany, which were unquestionably sculptured on the banks of the Danube. These facts cast an interesting light on the traffic in church ornaments during the days of paganism. clearly reveals that they are not the handiwork of foreign masters and of some great center of art, nor even of those nomadic sculptors who traversed the land in quest of lucrative or honorific employment, but of the modest stone-cutters of some neighboring town. The local origin of the largest monuments is best established, since their transportation would have involved both numerous risks and extravagant expenditures. Our collection of large Mithraic bas-reliefs thus constitutes a highly interesting group for the study of the provincial art of the empire. Like the mass of votive tablets that have come down to us, these sculptures, which were exhibited in the apse of the temples for the adoration of the faithful, are also far from being masterpieces of art. But they were nevertheless not executed with the same carelessness, and we feel in their presence that their authors bestowed upon them their best energies. If the artists afforded no proof of originality in the invention of subjects, they nevertheless give evidence of ingenuity in the arrangement of their figures and of their skill in handling the material. the Christian mosaicists decorated the walls of their churches. We shall not inquire here into the origin of each one of the different representations which are portrayed upon our monuments; we shall merely observe that in spite of their variety two or even three clearly marked classes may be distinguished. Some of the figures have been borrowed outright from the traditional types of Græco-Roman art. Ahura-Mazda destroying the monsters that had risen against him is a Hellenic Zeus annihilating the giants with his bolts; Verethragna is transformed into a Hercules; Helios is a young man with long flowing hair, mounted on the usual quadriga; Neptune, Venus, Diana, Mercury, Mars, Pluto, Saturn, are shown to us in their ordinary aspect with the garb and attributes which are known to have been theirs from time immemorial. Similarly, the Winds, the Seasons, and the Planets had been personified long before the propagation of Mithraism, and the latter cult had only to reproduce in its temples the models that had long since been made popular. 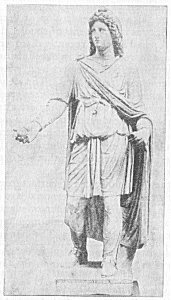 MITHRAIC KRONOS, OR PERSONIFICATION OF INFINITE TIME. of the innovations which the Mithraic iconography introduced contrasts painfully with the importance of the religious movement that provoked them. We have, in this, an additional corroboration of the fact that in the epoch in which the Persian Mysteries spread throughout the empire, the ancient sculpture was doomed beyond recall. Whereas, during the Hellenistic period, sculptors were still able to conceive new forms felicitously adapted to the character of the Egyptian divinities, under the empire, on the other hand, the majority of the Mazdean gods, despite their very peculiar nature, were compelled, whether or no, to take on the form and the garb of the denizens of Olympus. And if for some of these strange subjects new types were actually invented, they were in every instance distressingly commonplace. The superabundant wealth inherited from the ancient generations had enervated the generative potencies of art; and, accustomed to draw from these rich stores, art had grown incapable of all individual productivity. awaken it they addressed themselves mainly to the reason. In spite of the many appropriations which it made from the treasury of types created by Greek sculptors, Mithraic art rested at heart Asiatic, like the Mysteries of which it was the expression. Its predominating idea was not to provoke an aesthetic impression; it aimed not to fascinate, but to tell its mission and to instruct,--faithful in this also to the traditions of the ancient Orient. The jumbled mass of personages and groups which are presented on some of the bas-reliefs, the host of attributes with which it surcharged the eternal Kronos, 1 show us that a new ideal was born with the new religion. These uncouth and unappealing symbols, the manifold use of which our monuments exhibit, did not allure by their elegance or nobility; they fascinated the mind by the disquieting attractions of the Unknown, and provoked in souls reverential fear for an august mystery. although in essence they were diametrically opposed to its spirit. So with the images of the Heavens, the Earth, and the Ocean, of the Sun, the Moon, and the Planets, and of the signs of the Zodiac, of the Winds, the Seasons, and the Elements, so frequent on the Christian sarcophagi, the mosaics, and miniatures. The mediocre compositions which the artists had conceived to represent the episodes of the legend of Mithra appeared also worthy of imitation to the Christian ages, which were even more powerless than their predecessors to shake off the traditions of the workshops. When, after the triumph of the Church, Christian sculptors were confronted with subjects hitherto unattempted, and found themselves under the embarrassing obligations of depicting on stone the personages and stories of the Bible, they were happy in the opportunity of being able to draw inspiration from the portrayals which the Persian Mysteries had popularized. A few alterations in costume and attitude transformed a pagan scene into a Christian picture. Mithra discharging his arrows against the rock became Moses causing the waters of the mountain of Horeb to gush forth; the Sun, raising his ally out of the Ocean, served to express the ascension of Elijah in the chariot of fire; and to the time of the Middle Ages the type of the tauroctonous god was perpetuated in the images of Samson rending the lion. 209:1 In the original this chapter appeared as an Appendix. We have given it an independent place in this edition.--Tr. 210:1 Compare my large work, Textes et Monuments figurés relatifs aux Mystères de Mithra, Vol. II., pp. 180 et seq. 211:1 T. et M., Mon. 27, Plate II, opposite p. 209, Vol. II. Conmut thinks these statues are prior to Hadrian. 213:1 T. et M. Mon. 79, Fig. 67; and Mon. 38, Fig. 45. 214:1 M. von Schneider, loc. cit., Vol. II., p. 488, who sees in this composition "ein verblüffendes technisches Geschick," compares it with the relief on the base of the Antonine column (Brunn, Denkmäler gr. u. röm. Skulptur, Pl. 210b), and a bas-relief of the Campo Santo of Pisa (Dütschke, Bildwerke in Ober-Italien, I., No. 60), and the bust of Commodus in the Palais des Conservateurs (Helbig, Führer, second ed., No. 524). The same application of the technique of metal-working to marble may be noticed in two admirably preserved busts which were discovered at Smyrna and are to-day to be found in the Museum at Brussels (Catal. des antiquitées acquises par les musées royaux depuis le 1er janvier 1900, Bruxelles, 1901, Nos. 110-111). 216:1 The absence of machinery naturally excluded any absolute resemblance, but some of our bas-reliefs are certainly from the same hand or at least from the same workshop. Cf. T. et M., Vol. II., Mon. 45 and 46; Figs. 85 and 95, Fig. 87; 192 and 192 bis; 194 and 195. 216:2 T. et M. Vol. II., Nos. 138 to 183. 217:1 Friedländer, Sittengeschichte, Vol. III., p. 280. 217:2 T. et M., Vol. II., Mon. 267 and the note on p. 390. 218:1 T. et M., Vol. II., Mon. 235 and the note on p. 338. Cf. supra, p. 122, Fig. 26. 218:2 Wattenbach, Passio sanct, quatuor coronat., with the notes of Benndorf and Max Büdinger, 1870; cf. Friedländer, op. cit., p. 282. A new text has been published by Wattenbach, Sitzungsb. Akad., Berlin, XLVII., 1896, p. 1281 et seq. There still exists of this work an unpublished Greek translation; cf. Analecta Bollandiana, XVI., 1897, p. 337. 220:1 Lucian, Jup. trag., § 8. 227:1 Cf. p. 139, Fig. 35, and p. 105 et seq.